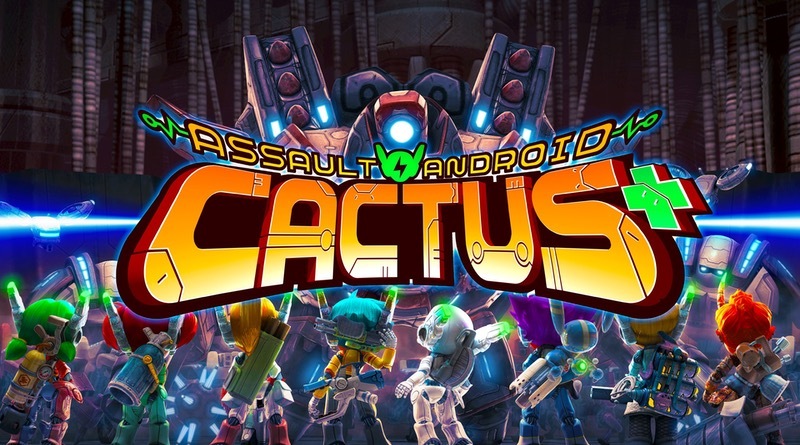 Assault Android Cactus+ is a twin stick shooter set in a sci-fi universe. You play as the android cop Cactus, whose response to a distress call ends up trapping her on board of a space station being taken over by robots. Now you must work together with a ragtag group of androids to stop the robots and recover the space station. While twin stick shooters are nothing new on the Nintendo Switch, Witch Beam Games has made a rather interesting addition to the genre with Assault Android Cactus+. In fact, it’s one of the best representations of the genre on the system! Twin stick shooters have been around since the ‘80s in the arcades. They have been made even more popular with games like Smash T.V. and Geometry Wars. The controls here are pretty much what you’d expect. The left analog stick moves your character and the right analog stick controls your aim. Hold down the right trigger to shoot down countless waves of enemies swarming your every move. There are nine playable characters, each with their own unique weapons and sub-weapons. The normal guns have infinite ammo and can even be upgraded by defeating certain enemies. Sub-weapons can only be used once before needing to be recharged, but often deal more damage and are just plain fun to use. You also have infinite lives in this game, but you do have a battery meter that drains at a fixed rate (sort of like a timer). You can recharge it by killing enemies and hoping for some batteries to drop. Robots also occasionally drop power-ups that can increase your speed, give you extra guns, and even freeze enemies in place. The main mode of this game is the campaign. You fight your way through arena-like levels fighting waves of enemies in order to reach the boss at the end. The developers wisely chose to create some really fun stages that change up the way the game plays. One level takes place on a moving train, where the speed of the vehicle directly impacts your movement. Another one is filled with conveyor belts, making it difficult to avoid the enemy laser guns. These changes keep the game fresh and exciting, as you never quite know what to expect in the next area. If you want to head straight to the boss you can do that as well – if you think you’re good enough. Thanks to a variety of modes and options, this is the perfect game for both beginners and veterans to the twin stick shooter genre. The gameplay is simple and easy to learn, yet it will take a lot of practice to master. Veterans of these types of games will probably have no problem beating the campaign, especially if you’re teaming up with some friends. The sub-weapons are plentiful and very powerful against the enemies, allowing you to sort of brute force your way through the bosses. However, skilled players will want to try out Infinity Drive. This mode has you defeat wave after wave of enemies while trying to keep your battery from dying. How long can you last? Also Campaign+ dials up the difficulty in a remixed version of the main mode. The bottom line is there’s plenty of game to enjoy here no matter you skill level. Aside from the three main game modes you also have Daily Drives – challenging levels that change daily. If you’re into killing bosses you’ll want to check out the Boss Rush mode to see how many you can defeat in a row. By completing levels here or in the campaign you will earn points that can be used to unlock new content. This includes some average stuff like character art and developer commentary, but what you’ll really want are the EX options. These fun additions allow you to really play around with the gameplay experience and have a great time. You can add AI partners, gain more powerful sub-weapons, change the size of your character’s head, and even change the camera from a top-down perspective to first-person! It’s fun to mess around with these unlocks. Although the game can be played alone, as is the case with many shooters it’s always fun to add a friend or three. With four player co-op the action becomes even crazier and it can be difficult to keep track of where everyone is. This is even truer if you activate the aforementioned first-person mode where the game splits the screen into four parts. It’s best to play on a large TV for this as your viewing real estate gets chopped up into quarters. Presentation-wise Assault Android Cactus+ delivers the goods. The game runs super smooth, even in the most enemy-filled levels. The level designs have far more effort put into them than we typically see with this genre, and the music matches the frenetic action on-screen with some fun techno tracks. The character models, voice work, and animations are all well done. Small touches and flourishes in the menu transitions and sound design are much appreciated. Of course not everything is perfect. I don’t care for how slow the characters move, which can make it difficult to avoid some of the attacks from the enemies. While there is a speed-up power-up that helps, it’s often not available during the bosses, where it could be the most helpful. Also the story is pretty much non-existent. There are only three cutscenes in the game and I would have loved to see more, especially when new characters join your team. A little more exposition would have really sold the story, but it’s not enough of a miss to really have a negative impact on my enjoyment of the game. Those that like twin-stick shooters should find plenty to enjoy here. It’s also a great place for beginners to jump in thanks to its approachable controls and not too difficult main campaign. If you’re looking for a fun couch co-op experience, this one should fit the bill nicely. Assault Android Cactus+ is a great highlight of the twin-stick shooter genre on the Switch. Both newcomers and veterans will find something to like here with the variety of game modes on tap. A great deal of fun is waiting to be had here, whether playing solo or with friends in couch co-op.